There is a growing body of research evidence that the learnable, measurable skills of emotional intelligence are the “Difference that makes the difference” — see 6sec.org/case. SEI offers a practical, powerful framework to understand and grow emotional intelligence. Where other tools provide a diagnosis, SEI provides a framework for action. The model is simple enough to jump in, but sophisticated enough to drive long-term transformation. SEI is led by a global team, available and validated in 20+ languages. While the SEI is designed for learning and development, it has the statistical rigor to be used in selection and in advanced applications. There is a DEEP and wide range of programs and tools to support the use of the tool — numerous books, training curricula, classroom programs, and hands-on tools. How does this work for business? Are your leaders great at leading people? Most managers are promoted for their technical and business skills — but find the “soft side” hard. “One of our biggest challenges is how to get more employee engagement under challenging times with diminishing resources. SEI has been an effective tool for identifying emotional intelligence issues and improving discretionary effort including ‘real world’ action plans for improving emotional intelligence. Engaging people in change, proactively resolving issues, setting a context for performance, building collaboration… they all require emotional competence. To change the outcomes, your leaders need to change the inputs — and to do so they need new awareness, attitude, and skills. 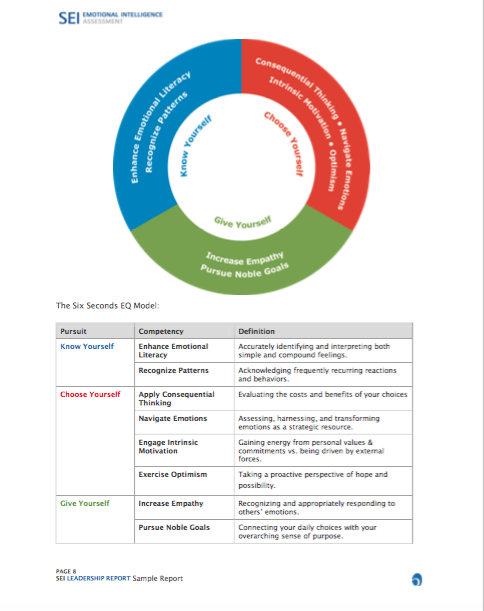 The Six Seconds Emotional Intelligence Assessment (SEI®) provides a solution to help leaders measurably improve in the people-side of performance. 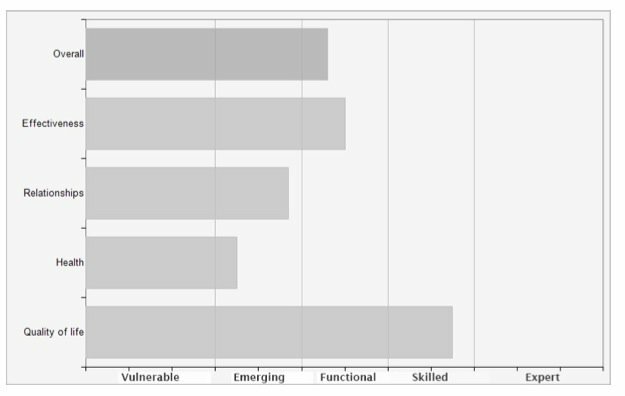 The tool assesses competence and delivers a practical roadmap for development. SEI scores predicts over 54% of important success factors: decision-making, influence, effectiveness, relationships, quality of life, and health — essential outcomes for thriving teams. 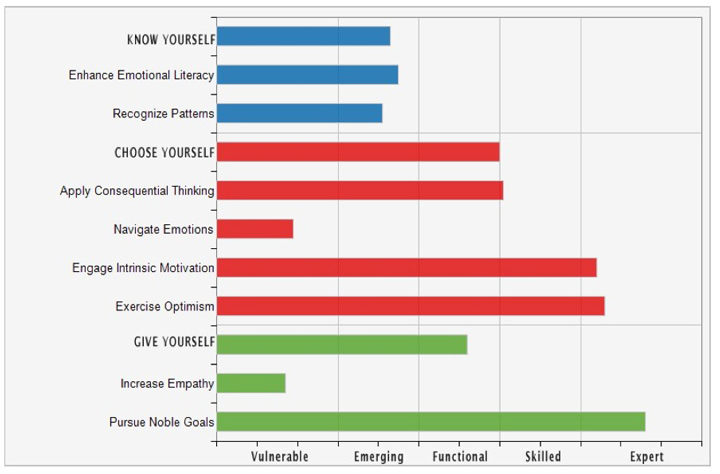 The World Economic Forum’s “The Future of Jobs” research identifies emotional intelligence as one of the top skills for the future. Why? Today, success requires collaboration, influencing across boundaries, and navigating complexity — skills that are fueled by emotional intelligence (or “EQ”). But it’s not enough to “have” the skills — results come from using them. That’s why SEI offers a robust framework for putting EQ into action, including the world’s first machine-learning neural network for translating EQ data to practical action steps. In the hands of skills practitioner, this data is incredibly powerful. We can make numerous inferences and begin to talk to “Hank” about some massive strengths — and what’s holding him back. Looking at the Navigate Emotions and Pursue Noble Goal scores, it’s evident that he’s emotionally disconnected from his own sense of purpose. He’s operating at a “head level.” The massive engines of Engage Intrinsic Motivation + Exercise Optimism might actually be running too fast, causing him to run people ragged — is it enough for him to be a sole star, or does he want a winning team? Based on the high PNG, we can leverage his vision to make a commitment to bringing others along. But for Hank, as for so many leaders, his first step is to increase the self-awareness. Until he tunes into what’s happening internally, he’ll keep tripping over these low scores. fortunately, he has the capability in Apply Consequential Thinking to see these risks… and the drive in EIM and PNG to do the work. Of course, the feedback from an assessment is just that: Feedback. We use the data to guide the conversation, and we support the client to reach her goals. To learn more, sign up to take the SEI and get a debrief! What reports / outputs are available from SEI? There are several reports available, all from the same questionnaire — this is one of the many options you’ll be able to set to administer the tool through our Tools Intranet. UEQ :: Unlocking EQ Profile introductory profile provides a quick entry to the subject focusing benefits of EQ & how to start. There are also a whole set of 1-page Brain Profiles ideal for facilitation, selection, management applications. NN: Neural Net Report — The world’s first advanced machine-learning-based EQ assessment, the NN provides an efficient and powerful way to put EQ into action. The SEI can also generate a scored dataset in a special xls file for use in selection (or group analysis) — and we have a custom API that can feed SEI data into your organizational metrics. The SEI toolkit also includes the SEI360 and the SEI-Youth Version.